Angel in the Sickroom: Go Canada! I should be doing my Nursing 170 paper right now but I guess I have to express how happy I am that CANADA WON GOLD IN HOCKEY!!! Ok, I'm not technically a "Canadian" (I will be next year, yeay!). I was born in the Philippines but I live in Canada, I will grow old here in Canada, and I will probably die here in Canada. So basically Canada is my home and I love Canada. I share the passion and the pride that many Canadians feel right now. I am not a huge fan of sports and I was never interested in hockey, but I support Team Canada and my country. I wasn't able to watch every event during the 2010 Vancouver Olympics as I had midterms and work but I really tried to watch the hockey game as everyone knows, hockey is Canada's game. 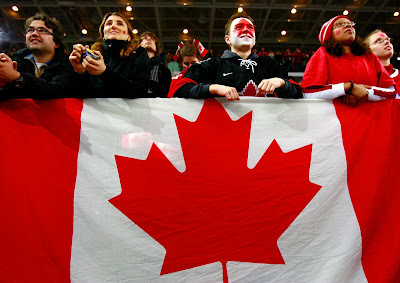 It was very depressing the way Canada lost against the US during the pool play but in the end Canada was victorious and it just brought life in the streets. I was driving downtown and all I could hear were people screaming in celebration and people waving the Canadian flag with pride. It was just crazy! Anyway, that's about it. Go Canada!